1) Wash only full loads of laundry. Waiting until your washing machines is full is a simple way to reduce overall water consumption. Whether they are full are not, they use 20 to 40 gallons (depending on the model), consuming as much as 22% of indoor household water. Like washing machines, showers also use a lot of water, as much as 17% of indoor use. Taking shorter showers, five minutes or less, is recommended. A fun way to practice this method by playing a song on your phone and challenging yourself to finish showering before the song ends! 3) Install low-flow shower heads and faucet flow restrictors. You can purchase quality, low-flow fixtures for around $10-20 each and save 25-60% of water that would have been wasted. 4) Only run water when actually using it. We have all heard this one, but it can make a big difference! Faucets use 16% of indoor water and even something simple like turning off the tap while brushing your teeth or shaving can save more than 200 gallons of water per month. The same method can also be applied when you are doing dishes. 5) Operate dishwasher only when fully loaded. Every time your dishwasher is run, you use between 9 and 25 gallons depending on your model. You can also save water by scraping food from the dishes first, allowing the dishwasher to run more efficiently. Replacing older 4-6 gallon per flush toilets or even 1.6 gpf versions with new 1.28 gallon per flush High Efficiency Toilets can save plenty of water. It will need to be done anyway if you sell your house, so why not reaps some of the savings for yourself! 7) Water your lawn only when needed. Your water company has likely already instituted 2-3 day per week restrictions on lawn watering. A good tip is that if you step on your lawn and the grass springs back, it does NOT need to be watered. 8) Water early in the morning. It is a good idea to set your sprinkler timer to water early in the morning when temperatures and winds are at their lowest levels to reduce evaporation. In addition, periodically check your irrigation system for spray heads blocked by plant growth, poorly aimed nozzles, and broken heads. 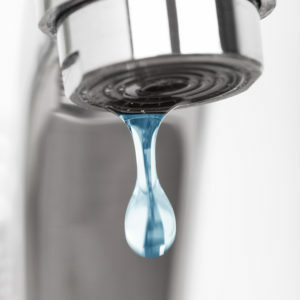 Be on the lookout for leaks and running toilets and make sure to call Green’s Plumbing to fix them right away!